Over the past few months, I've started eating way more vegetables and running every other day in hopes that I can drop a few of the fifty pounds I gained since moving to Atlanta. I know. That's a lot. No one feels it more than I do. The thing is, I used to have an excellent metabolism, and it just decided it would quit when I moved to Atlanta. But that is neither here nor there. 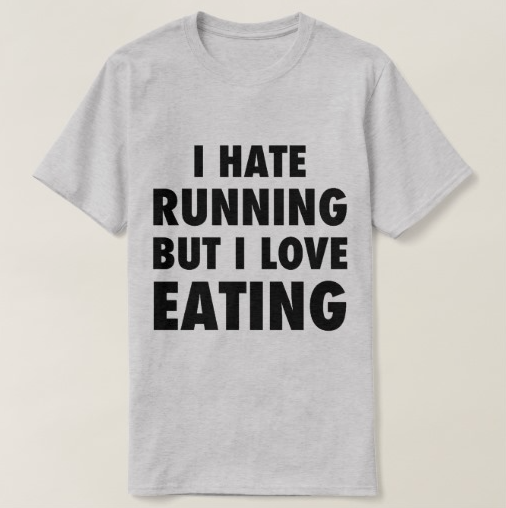 I've been running, and I hate it. But still, I do it. So, I thought I'd make a shirt that says exactly how I feel about this situation. Above you can see an image. If you feel the same, then you can get your own by clicking the link below.